Condensed timelines of Josef Jakobs' time in England generally have him landing in Ramsey, Huntingdonshire, being transferred to Ham Common (a.k.a. Camp 020) on the outskirts of London and then being executed at the Tower of London. In truth, Josef was transferred between several London locations from February 1 to August 15. Old main entrance to Brixton Prison. On February 1, after being briefly interrogated at Cannon Row Police Station by Major T.A. Robertson of MI5, Josef was transferred to Brixton Prison Infirmary for treatment of his broken ankle. On February 3, the doctors at Brixton Prison decided that Josef's broken ankle needed more medical attention than they could provide, and Josef was transferred to Dulwich Community Hospital. Josef was not done with Brixton Prison however, and around March 31, Josef was once again held in the Brixton Prison Infirmary after developing a fever at Ham Common. Josef would spend about two weeks in Brixton Prison Infirmary, being released to Ham Common on April 15, 1941. Brixton Prison opened in 1820 as the Surrey House of Corrections and became infamous for the treadmill that was installed as a punishment device in 1821. The treadmill was essentially a never-ending stair-master and was eventually banned in 1902. 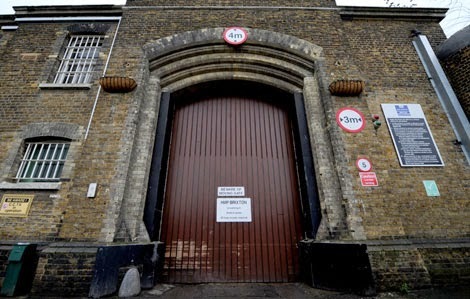 In 1853, the prison was converted to a female prison and remained so until 1898 when the prison became a trial-and-remand centre for London and the Home Counties. An 1870 plan of the prison shows the various wards and the exercise grounds. The central hexagonal building in the middle is labelled offices and was later known as the Regency Roundhouse. Constructed in 1819, the building would serve as the Prison Governor's house at some point and most recently has been refurbished as The Clink restaurant. Along the top of the diagram are two buildings, one labelled Stores and one labelled Infirmary. The same buildings can be seen in an oblique view of the prison from the opposite angle (i.e. looking south). From this perspective, the Infirmary, where Josef was held is the building in the lower left foreground of the picture. Today, the prison looks very different from the Victorian images. 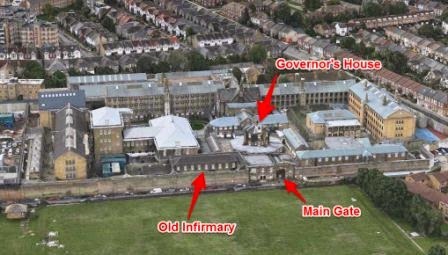 Aerial view of Brixton Prison from Apple Maps via Brixton Blog website. The Governor's house is still visible and from there, one can identify the old Infirmary building as well as the Main Gate. Many of the original wards have been rebuilt or removed. Unfortunately, no medical records from Josef's time at Brixton Prison Infirmary are contained within Josef's Security Service files (KV 2/24, 2/25, 2/26, 2/27).